When they were beta testing Firefox 4, I was pretty under-impressed. In fact, I deleted it and went back to 3.6 mainly because it kept crashing. Well, today I wanted to get onto the Mozilla Motivational Poster maker website and it wouldn't really work without Firefox 4, so I downloaded. It is no longer being beta tested so I am assuming the kinks have been worked out. I did the little tour and found some really helpful aspects to it and even changed my personna. My browser is looking pretty snazzy. Well then I had to change my iGoogle page so it would be color coordinated, of course. But, back to Web O' Wonder; it's more like Web O' Eye Candy Wonder...I LOVE this site. There are a multitude of options to explore. Today's pick came from the TCEA TechNotes recommendation of the Mozilla Motivational Poster maker. This is a lot of fun; you can load in your own picture or you can use one from their database. I can see so many uses for this website in all core content areas. So, if you want to get motivated, start creating! When I first saw the link for this on my TCEA Technotes, I thought it was a typo, but alas...it was not. There is actually an interactive, and quite compelling, simulation called Blood Typing, in which the player must take blood samples, type the blood, and administer blood transfusions! It is on the NobelPrize website and I will have to admit, it's fun! Let your students experience the thrill of saving lives all while learning the process of typing blood. Who knows, one of your students may save your life one day! If you are looking for a new website that offers students the opportunity to create their own stories, you may want to check out this site, Little Bird Tales. What I love most about this site is the ability to narrate the stories. Each page of the book can be read by the author! The website also allows students to create their own drawings right on the site or upload a picture of their choosing. There are no ads on the site and it is quite visually appealing! What a great way to reinforce reading and writing skills! Once the book is completed, it is saved within your account and you can go back and edit the story, delete it, or enter email addresses with which to share the finished product. A link is sent for the audience to view the book. It plays as a video showing each page along with the narration...pretty cool deal, but I would love to see an embed code added to the offerings. Check it out...one more great tool for digital storytelling. With the increased use of learning management systems like Edmodo or Project Share, I found a great and easy online quiz maker, ProProfs Quiz Maker, that allows for the embedding of the content. This is a great tool to use with your LMS to provide formative assessments so the students can check their progress. Another great component to this quiz maker is the ability to explain each answer so if the student misses a question, they will be able to determine not only what the correct answer is, but an explanation of why. This site also allows you to track the quiz results and view reports. It is a free site, but there is also a paid version. This is a great tool that will certainly compliment your learning management system...implement one today and see just how easy it is! During Spring Break last week TCEA published their Technotes that I always look forward to because of the great resources they include. One of the sites they listed last week really peaked my interest so I checked it out; it was called PrintFriendly. It is a website that allows you to turn a webpage into a print friendly page or it can PDF the page for you. I found this particularly helpful this past week as I was preparing to take the Tech Apps certification test. There were various websites with practice tests and material that I wanted to print for study guides. As long as the page has text for the site to parse, it works beautifully and provided me with some great study material. Another cool thing I found on this website is a plugin to embed in your blog or website that allows your readers to print or PDF the webpage. What a helpful widget to add for your readers! Check mine out...it is at the bottom of this post. The main thing I loved about this site was how easy it was to use and how helpful it was in my pursuit of gathering study materials. Wouldn't this be great for students as they work on research projects! So, my suggestion would be to bookmark this site for the future when you need to print a copy of the information detailed on that web page you just have to keep. Read more about these artists by clicking here. University of South Florida (USF) has a Lit2Go program in which they have created audio books of all of the classics, ready for download. MIT has video of all of their lectures, most notably, physicist Walter Lewin. The states of Virginia and Tennessee (Barnett's favorite) have created a wealth of content worth checking into. Another session of particular interest was about developing Classroom Learning Networks. Modeled after the Personal Learning Networks, teachers can create these with their students using Twitter, and social bookmarks like Delicious or Diigo,along with subscribing to some blogs of experts in the field of the topic at hand. This session was led by two communications professors from St. Edward's University, Corinne Weisgerber and a fellow colleague. A fascinating topic, this session was filled with lots of possibilities. Another session that proved interesting detailed a resource that has been built into Project Share by PBS. June 1st of this year, PBS will be launching a new resource website, Digital Learning Library, that will be aligned to 20 of the state's standards. This new resource has been launched first through Project Share in the Content Repository tab and is currently available. Check it out; once a topic search is enacted, it is the tab next to the New York Times resources. There are some incredible assets included here. The last session I wanted to mention was one I did not attend, but that received a lot of Twitter activity. One blogger, EdTechSandyK did attend and I wanted to include information from this session. It covered Dynamic Digital Portfolios. Sandy included some detailed notes from the session along with resource links and a link to the Prezi. This was an incredible conference with stimulating dialogue. I am in hopes of returning next year...at least if I have a job. We have been trying to figure out a way to broadcast our morning announcements at Miller Elementary with little setup and prior preparations. Trying to video a school broadcast, create the video, send it to the webmaster, and get it posted everyday is too much trouble...so we have been searching. UStream was not an option due to the inappropriate commercials that have begun to appear on their site, so last fall the search began. We stumbled upon Vokle, a great little website that allows live broadcasting with interactivity. Currently there is a live broadcast occurring right now with 11 people being broadcast at once! Skype hasn't managed to get 11 people on at once, but this website has! What I really love about Vokle is the ability to embed your event on a web page. In trying to facilitate a live broadcast of our children doing the morning announcements, we are thinking about embedding it in a closed environment that requires a password. If you check the Test box in your event setup, it will not be available on the Vokle website for others to view. I love this site. I could see teachers embedding an event window in their Edmodo account and broadcasting student presentations or class parties. The possibilities are endless. I love you Vokle...you make me vocal about your awesomeness. I know everyone wanted the new iPad2 to have a camera, and yes, I thought that would be nice, but I think as a teacher, the best new feature is its capability to project its desktop. This is crucial for maximizing the use of all those fabulous apps! One of my favorite is the Frog Dissection, but its inability to project for the entire class to see at once, makes it much less desirable. So...in my opinion, I would have given up the camera for this one feature...just glad I didn't have to! There has been talk that these pads would revolutionize learning. I don't know if that will happen, but it sure will be fun to explore the possibilities...enjoy the video that describes this new product. Thanks Apple! We have been playing with Voxopop for about a week now. I started to blog about it last week, but I just really wasn't sure how it could be used. In fact, I really didn't have a clear understanding of its function. It's not that it is hard to use...it's really easy. But when something comes along that really changes how things are usually done, it takes a little bit to wrap your brain around it...So, what is Voxopop? This site allows you to go in and start threaded conversations with collaborators, but I think the feature I like the best is you can then load it into iTunes as a podcast with chapters. You create these talkgroups. It is a bit like a voice version of a message board. You no longer have to collaborate only with peers in your classroom. You might have two students from different classes work together on a project, or better yet, a student from another school! We have been talking about how this could be used in the classroom. Book talks, collaborations on the development of projects, story or writing construction...the list of possibilities is endless. So check this site out and I would love to get some dialogue on other ideas for how this could be used in the classroom. 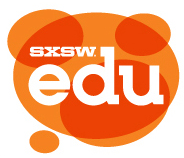 Interestingly, Voxopop is up for an award at the SXSW Interactive Conference in Austin March 15th. They present awards for the best interactive websites of the year. Good luck Voxopop...you are a winner in my book. Our district requires all teachers to receive a minimum of 19 hours of professional development for technology each year. Many different trainings are offered throughout the year, but the mainstay is the three day tech camp in the summer. This camp provides teachers the ability to receive all the needed hours so they don't have to worry about it once school starts. The problem is...new teachers to the district sometimes miss out on this opportunity and struggle throughout the school year to fulfill that technology requirement. Click here to view a listing of free professional development webinars offered every day that can provide you with valuable information on the latest edtech trends. Check it out; you can find a variety of topics that will certainly be beneficial for both you and your students...Go forth and get educated! District Innovative Specialist for Midlothian ISD; Google Certified Innovator; Google Education Trainer; GEG-NORTX Leader, 2019 SXSWEdu Advisory Board; love learning new things every day! Firefox 4 + Web O' Wonder = The Coolest Ever! ©2018 Witherspoon. Powered by Blogger.